Reason for Reading: It caught my eye on amazon.com’s best of 2004 list. Synopsis: Experts are experts because they’re smarter than the average random crowd walking down the street, right? Maybe not. Surowiecki sets out to prove that as long as certain conditions are met, group decisions and actions can average out to a better choice than ones even experts can come up with. From Google to traffic jams to taxes, Surowiecki demonstrates time and time again that society could be much better if we’d drop the idea of the solitary genius and instead consider everyone’s input. Why you should read this book: Wowza, what an idea, and Surowiecki does an excellent job proving himself right, despite all the contrary ideas you may begin with. It’s full of fascinating ideas that should be considered by everyone from politicians to business leaders to scientists to, well, you, because we all need to make decisions in our lives. This is the sort of book you may want to think about buying, just because there’s so much to process, with interesting tidbits of information and mind-boggling ideas bursting off of every page. The Wisdom of Crowds will also make you want to start sending copies to strangers – transportation ministers, so they can see how to reduce traffic jams, for example. Well-written, absorbing, and surprisingly fast-paced, The Wisdom of Crowds is definitely a worthwhile read. Why you should avoid this book: While the first two-thirds of the book are packed with more day-to-day information that would be interesting to a wide variety of readers, the final third delves heavily into business and the stock markets. Some people will find the business ideas a bonus, if not the main appeal of the book, but others may find it rather dull after the punchy beginning. You definitely want to go into the book with an open mind, because Surowiecki is certainly right that it’s hard to wrap your brain around the idea that hiring a crack team of experts maybe be inferior to consulting a more diverse crowd of random people. If, years hence, people remember anything about the TV game show Who Wants to Be a Millionaire?, they will probably remember the contestants’ panicked phone calls to friends and relatives. Or they may have a faint memory of that short-lived moment when Regis Philbin became a fashion icon for his willingness to wear a dark blue tie with a dark blue shirt. What people probably won’t remember is that every week Who Wants to Be a Millionaire? pitted group intelligence against individual intelligence, and that every week, group intelligence won. The explanation for people’s behavior might have something to do with an experiment called the ‘ultimatum game,’ which is perhaps the most-well-known experiment in behavioral economics. The rules of the game are simple. The experimenter pairs two people. (They can communicate with each other, but otherwise they’re anonymous to each other.) They’re given $10 to divide between them, according to this rule: One person (the proposer) decides, on his own, what the split should be (fifty-fifty, seventy-thirty, or whatever). He then makes a take-it-or-leave-it offer to the other person (the responder). The responder can either accept the offer, in which case both players pocket their respective shares of the cash, or reject it, in which case both players walk away empty handed. If both players are rational, the proposer will keep $9 for himself and offer the responder $1, and the responder will take it. After all, whatever the offer, the responder should accept it, since if he accepts he gets some money and if he rejects, he gets none. A rational proposer will realize this and therefore make a lowball offer. In practice, though, this rarely happens. Instead, lowball offers – anything below $2 – are routinely rejected. Think for a moment about what this means. People would rather have nothing than let their ‘partners’ walk away with too much of the loot. They will give up free money to punish what they perceive as greedy or selfish behavior. The Seattle incident was unusual because it took place during the morning, but the presence of what sociologist Leon Mann calls the ‘baiting crowd’ was not a complete surprise. In half of the cases of suicide that Mann studied, crowds gathered to egg on the would-be jumper. Mann found that crowds were most likely to act this way at night, when it was easier not just to go unidentified but also to imagine oneself as part of a bigger group. And the larger the crowd, the more likely it was to scream at the jumper. The bigger the crowd, the easier it was to feel anonymous, to be sure. But it also seems likely that the more people who were yelling, the more people wanted to yell. Baiting crowds are, of course, relatively rare. But the dynamic that drives them seems very similar to the behavior of rioting mobs. Also recommended: Struck by Lightning by Jeffrey S. Rosenthal; Blink by Malcolm Gladwell; The Tipping Point by Malcolm Gladwell. 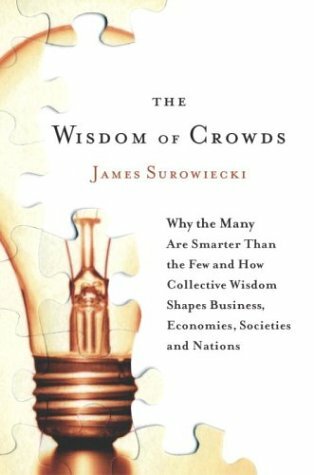 Also by this author: The Wisdom of Crowds is James Surowiecki’s first book. Fun tidbit: Surowiecki writes a business column, ‘The Financial Page,’ for The New Yorker. Would I read more by this author? Yes – I like unusual ideas.